My love for robots will always keep a special place for the Battletech universe. As much as I'll forever remain a Transformers fan, that doesn't mean that I can't also love giant Battlemechs piloted by noble warriors in a futuristic feudal society. And yes, I totally love how that's a bit of an oxymoron and yet it actually isn't. I'm going back in time to try and read and review all of the different Battletech fiction novels released over the years. Admittedly this now a less than legal venture given how a lot of the classic books are not available for sale due to the complications of the unseen Mechs that can no longer appear in visual form. And just look at the awesome cover of this book - that's one big unseen Marauder right there. 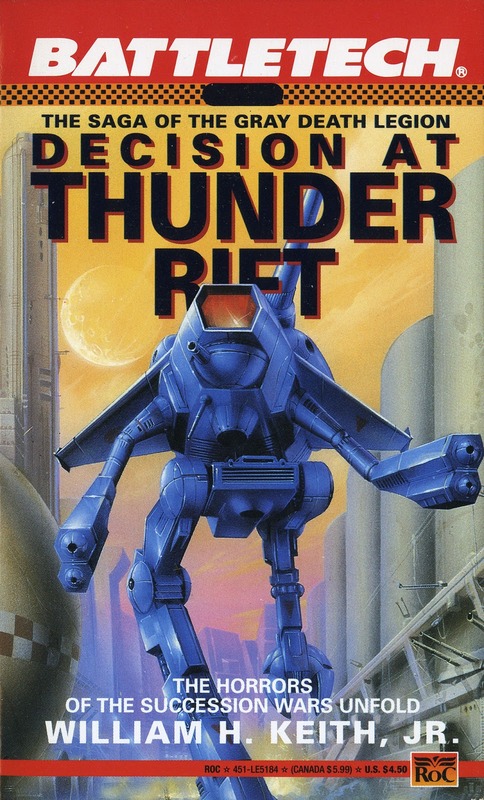 Decision at Thunder Rift is where it all began - the very first fiction novel set in the gaming universe of Battletech. And it also marks the beginning of the many books focused on the Gray Death Legion, one of the more iconic mercenary groups in the Battletech universe. Needless to say, it was quite the pleasure to read about how it all began. Synopsis: Battletech: Decision at Thunder Rift is the first fiction novel released set in the fictional Battletech universe popularized by the game of the same name. It was written by William H. Keith, Jr., who went on to write many of the novels in the franchise. It is the year 3024 and the mercenary unit Carlyle's Commandos is stationed on the remote planet of Trellwan near the border of the Lyran Commonwealth. The Commandos serve under Captain Durant Carlyle, who is concerned with the protection of this world against periphery pirate raids and the Draconis Combine, along with the challenges of raising his son Grayson to be his successor. But at 20 years old, Grayson is strong-willed and a bit of a rebel. He's more invested in his dalliances with Mara, the daughter of the local Defense Minister than all of his training by his various mentors. But for now, he's most looking forward to finally leaving the planet. Viscount Olin Vogel of the Lyran Commonwealth has brokered a deal with the nearby Oberon Confederation that turns the planet over to Oberon to protect, thus freeing up Carlyle's Commandos for duty elsewhere along the border with the Draconis Combine. Given the fact that Oberon is one of the groups that have raided Trellwan in the past, the locals weren't too happy about this plan with the details somehow leaked out. Now there's a strong anti-offworlder sentiment that is making the role of the Commandos all the more difficult. And just as the deal is about to be sealed, betrayal from within leads to the fall of Carlyle's Commandos with Grayson as one of the few survivors. The novel acts as a great showcase for some of the best elements of many of the Battletech novels that followed this one. You had a strong political angle to things given the interactions between the local Trellwan government, the Oberon Confederacy, Carlyle's Commandos and the Draconis Combine, to name a few. It also features a pretty strong protagonist, Grayson Carlyle, and thus provides us a very on-the-ground view of the story all the way into the cockpit of a Battlemech. And of course there are the battles - the complex strategies, the hit-and-run ambushes and of course the never ending struggle to control one's heat levels. As the first foray into the fictional world of Battletech outside the various source books for the game, it was a little interesting that we ended up with a story with very few Mechs. This book is set on a border world with few amenities and little in terms of true Mech assets. The invaders in the book are also pirates with little to bring to bear. So instead of some grand showcase of all the Battletech world has to offer, we instead got a much more focused story with a few iconic Mechs that all get their chance to shine. And as much as I love a good large-scale Mech battle, admittedly one can only focus on so many of those giant robots before losing track of things. So in hindsight, it was a great way to introduce new readers to the nuances of BattleMechs and allow them to get to familiarize themselves with a few Mechs. The personal story of Grayson Carlyle isn't quite as great as it could have been, but it's still a pretty solid story. He definitely faces the challenge of needing to grow up really fast in the face of the loss of his family and the many men pledged to his father. And this is the kind of powder keg environment that anyone is bound to come out better from. But this is the start of a longer journey, one that Keith seems to enjoy exploring and expanding in later books. Decision at Thunder Rift is a solid example of what makes the Battletech books so enjoyable. It is by no means perfect, but it's the best that one can expect from this sort of franchise genre fiction that makes up a good segment of the science fiction book market. And so I'm happy to rate this book as 4.5 complex anti-Mech infantry maneuvers out of a possible 5.